Alarm Indicator M4780 with MODBUS is a versatile 20 channel indicator panel, which can be used for monitoring of potential free dry contacts and signal states transmitted through a common 2-wire RS485 communication bus using the MODBUS-RTU protocol. The Alarm Indicator, M4780 provide flush mounted LED based indication with 20 channels. Each channel can be used to indicate the state of one potential free contact. Additionally, M4780 is equipped with a serial RS485 communication bus with only 2 wires. The indications of the unit can be controlled via this serial bus as well as from the direct connections. The controls via the bus can be made from any device capable of operating as a MODBUS master, e.g. 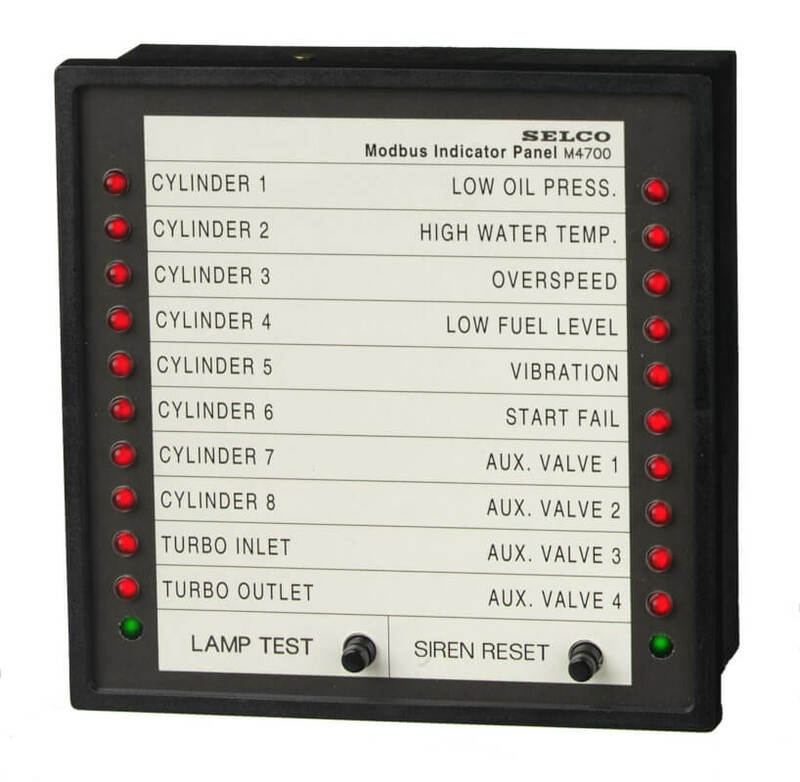 a PLC, a PC or the SELCO H0300 Event Logger. M4780 supports the standard MODBUS protocol (RTU mode), for communication on the RS485 bus. Alarm inputs, control of the relays, siren and the indications of the LEDs can be controlled via simple MODBUS commands. For instance, the unit has commands for quick flash, slow flash, short flash pulses, steady light or no light on the LEDs. When used in alarm systems, a quick flashing LED will typically indicate first new alarm. Slow flashing LEDs will indicate the following new alarms. Short flash pulses will indicate cable error. Steady light will indicate acknowledged alarms, and no light will indicate normal state. Via the bus it is also possible to reset the siren, the siren relay and all LEDs. An LED test can be performed and the LEDs can be dimmed from 0 to 100 %. This feature is particularly useful in ship applications where the panels are placed on the bridge.